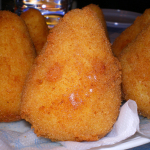 Arancine or arancini, according to the area of Sicily where you are are ,called female or male, are the street food of choice for ease of preparation, their storage and ease of transportation. They are found in all the bars and takeaways in Sicily and at all hours of the day. They are prepared doing a ball of boiled rice with saffron. In the traditional version is stuffed with meat sauce, mozzarella and peas and then breaded outside to be fried in hot oil to give it compactness and protect the content, it is precisely the frying which makes similar to oranges giving it that golden colour and which is probably the origin of the name. 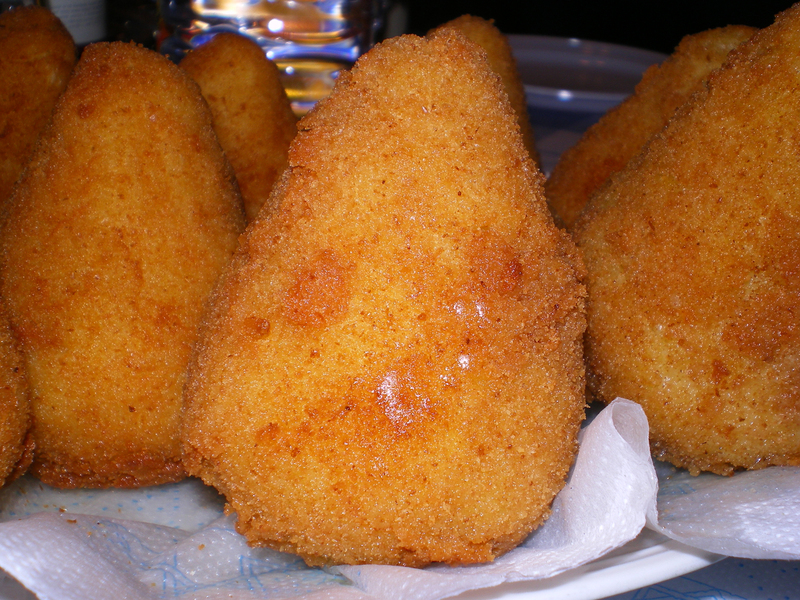 It ‘s almost impossible to determine the date on which the arancine appeared on the Sicilian kitchens, but for the type of preparation is likely to be a variant of the traditional Arabic food, in fact even today in the Arab countries people use to bring boiled rice with spices to mouth with their hands, accompanied by bits of meat. About the addition of external fried breading, someone wants to connect to the need to be able to transport the food, making it compact. Very suggestive is hypothesis launched by someone who wants to make up the breading an invention of one of the cooks of the Norman King Frederick II, Stupor Mundi, grappling with the problem of preparing food for long hunting trips. At first glance, the traditional recipe, which includes a filling of meat and tomato wrapped in rice cooked with saffron, has a great contradiction because the rice, essential in the preparation, nowadays is not produced on our Island. But not many know that the cultivation of rice was introduced by the Arabs in the ninth century during their occupation continued to be produced until 1868 when it was banned cultivation in the vicinity of the villages after the unification of Italy officially for reasons health. then add the laurel leaves, salt and black pepper and fade with red wine. and cook for half an hour until a dark patina appears on the surface. Once you are ready you will be able to combine all the ingredients, creating a nest with the rice in the palm of your hand into which you will put the meat sauce and peas previously prepared. Once closed you will have to pass it in the butter and breadcrumbs ready for frying. inside of the arancini wet.